'beachbreak' Opossum Bay - Best on the beach! A waterfront oasis with views to die for! beachbreak - Right at the waters edge, this property is a renovated and refurbished, fully equipped sparkling modern home featuring quality fittings and furnishings. Hands down the best on the beach!! If you want the WOW factor then look no further! This is the venue for your next getaway. Get lost in the serenity, enjoying stunning sunsets on the deck with uninterrupted beach and mountain views, swim in the sheltered bay directly out the front or make the most of some of Tasmanias best surf beaches just minutes away. A perfect place for fishing, diving, boating, hiking, golfing and exploring or just curl up and read a book. Fall asleep to the sound of the waves lapping at the shore. If you are lucky enough to secure beachbreak Opossum Bay during the SYD-HBA yacht race, settle in and watch the spectacular yachts tack into the bay on the final leg of their journey to Hobart. Book early for the summer as beachbreak is extremely popular from December to March and bookings fill early. All this within 35 minutes of Hobart CBD and 25 minutes from Hobart Airport make beachbreak Opossum Bay an attractive destination for couple getaways, executives retreat, family holidays or simply to take time out. The Opossum Bay Store is a stroll away and most supplies are available. Jetty and boat ramp is at the southern end of the bay and there is ample off street parking for cars and boat at beachbreak. We utilise an online booking system as well as an email and direct debit payment system for our accommodation and we ensure the process is simple and trouble free. If you prefer we can be contacted at anytime day or night via telephone and we will do everything we can to ensure that your holiday, from booking to stay, is easy, relaxing and memorable. We are confident you will have a great stay at our fantastic beachside retreat and like many others you will return every year! We are proud of our 100% satisfaction rate with all of our guests - just read some of the comments our previous guests have made! A spacious beach side holiday home with modern facilities - EVERYTHING is provided! beachbreak is ideally suited to couple getaways, executive retreat or small families. Sleeps a maximum of 5 persons in 2 bedrooms. Reverse cycle air-conditioning ensures maximum comfort whatever the weather, fully appointed kitchen with oven, microwave, dishwasher, fridge/freezer. Large LCD screen television, bathroom with bath and shower, washing machine, dryer, linen and bath towels are all supplied, two Gas bbqs including a new Weber Q, 3 decked areas with outdoor furniture, and outdoor shower! The boat shed is private and not for guest use. No smoking inside and sorry no pets. Our prices vary depending on the time of year, but we offer huge discounts for long stays of 7 nights or more. The longer you stay the less you pay! Enquire now to receive a quote for one of the most memorable holidays you could ever imagine. Our terms and conditions are in line with the standard terms found with most HomeAway rental properties. Basically all we ask is that the house be left *reasonably clean and tidy on departure and you treat the property as you would your own home. *We charge a standard flat $80 cleaning fee for the duration of all stays. Further charges may apply for any additional required cleaning beyond what would be considered reasonable, including a non-negotiable fee of $50 should the barbeque be left unclean. (Refer to our Terms and Conditions which shall be emailed upon booking request). Activities - summer or winter, beachbreak is the ultimate beach holiday! beachbreak is located in a unique part of Tasmania. Absolute waterfront location means you literally walk out the door and onto the sand. 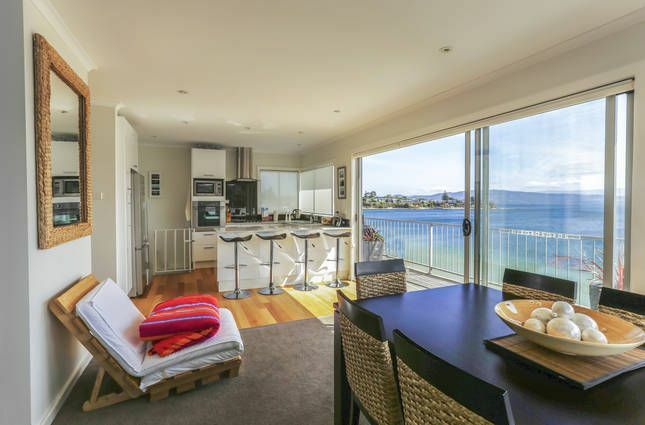 Fishing, diving, surfing, walks along the beach are right at your door, as well as the most spectacular sunset views over the Derwent River. The proposed Arm End Golf precinct at Opossum Bay is within view and just a short stroll from beachbreak. This makes beachbreak a very attractive stay for golf getaways and we are excited to offer golf accommodation packages in the future. The 18 hole course is expected to be completed soon. Another nearby 9 hole course at South Arm is a short 10 minute drive. With Hobart just a 35 minute drive away there are an abundance of activities available all within close proximity to beachbreak. Port Arthur, MONA, Mount Wellington, Bruny Island, fast ferry cruises and tours are all easy day trips. With plenty on offer you can do as much or as little as you like. In fact you will most likely prefer just to stay at home and enjoy the view and relaxation beachbreak offers! beachbreak has been owned by one family for over 40 years. What used to be known as 'the shack', has been transformed into a delightful and cozy beach house suitable for holidays all year, summer or winter. Chris and Jane are siblings and the property is now shared between their young families. beachbreak is incredibly unique. Located right on the beach with the most amazing water and mountain views and in a quiet seaside village, it's a place where you can wind down and totally forget that you are still within 35 minutes of a capital city! It's not often you are able to stay in your very own comfortable beach house located right next to the water and sand! Read some of the property reviews to see what previous guests have said about the location, the house and the easy booking process. We guarantee you will love our beach house and Opossum Bay! Opossum Bay is at the mouth of the Derwent Rver which flows into Storm Bay. Great surf beaches are nearby! Opossum Bay is a small village with one local store which supplies fuel, groceries, take-away food, ice and bait. There is a childrens park and jetty with boat ramp. The 180 degree beach, river and mountain views from beachbreak are to die for! beachbreak is RIGHT on the beach. Its a great and very safe swimming beach for all ages. The Arm End golf precinct is under construction and within view. The course is projected to be completed soon and is only a short walk from beachbreak. Panoramic views of Mount Wellington make a great outlook, summer or winter. Wake up each day and look straight out over the water! Direct access to the beach with great waterfront walks around the bays. The views are amazing all year round! Jetty and boat ramp located at Opossum Bay. Ample parking, childrens park, village store supplies fuel, bait, groceries and take-away food. Fantastic walks and the Arm End golf precinct all within view of beachbreak.